In the past two decades, there has been a considerable rise in incidence and detection of low-risk differentiated thyroid carcinoma (LRDTC). Postoperative care and surveillance are directed predominantly by guidelines laid out by the American Thyroid Association (ATA) which define a set of patients at low risk of recurrence. Various studies report the sufficiency of hemithyroidectomy (HT) in LRDTC.,, In 2015, ATA guidelines also stated that thyroid lobectomy (TL) alone may be sufficient in initial treatment. We analyzed our data for adequacy of HT in LRDTC and also the incidence of disease in contralateral lobe and evaluate effect of radioactive iodine ablation (RAIA). This was a retrospective study of all patients with LRDTC managed from 2008 to 2014 at a tertiary hospital. Our department protocol is to perform total thyroidectomy (TT) for all patients with proven well-DTC (WDTC). Patients with solitary nodule and benign/indeterminant fine-needle aspiration cytology are offered a diagnostic hemi/TT. Patients opting for a diagnostic HT are counseled regarding the need for a completion thyroidectomy if the histopathology is reported as malignant. Patients with macroscopic WDTC undergo thyroid whole body scan (TWBS) followed by RAIA if necessary. The protocol for TWBS in patients with microcarcinomas has changed over the years. During the initial period of the study, these patients were also receiving TWBS while in the latter part of the study, patients with microcarcinoma did not undergo a TWBS. All patients were reviewed with serum thyroglobulin (sTg) levels at the time of TWBS. LRDTC was defined for our study as follows: as those (1) in whom there were no local or distant metastases, (2) all macroscopic tumors were resected, (3) no invasion of locoregional tissues, (4) no aggressive histology (e.g., tall cell, insular, columnar cell carcinoma, and hobnail variant), (5) no vascular invasion, and (6) no I-131 uptake outside thyroid bed on posttreatment scan. The guidelines of ATA 2015 were referred to in defining the criteria. The demographic details, clinical profile, ultrasonographic features, surgery performed, histopathology, TWBS finding, need for RAIA, and sTg values were documented. Based on the histopathology, patients were divided into two categories: single-lobe involvement (SLI) or bilateral lobe involvement (BLI). Further subclassification was based on the maximum tumor size into T1a (<1 cm), T1b (1–2 cm), or T2 (2–4 cm) tumors. The data were collected from the computerized hospital information system and analyzed using Mann–Whitney U-test in STATA version 13.1. A total of 114/562 (20%) patients fulfilled the criteria for LRDTC and were included in the study. Their ages ranged from 15 to 61 years, 83 were female and 31 were male [Table 1]. Overall, 89/114 patients underwent an upfront TT while 25/114 underwent a diagnostic HT followed by a completion thyroidectomy. In 52/114 (46%) patients, the histopathology revealed bilateral disease [Table 2]. 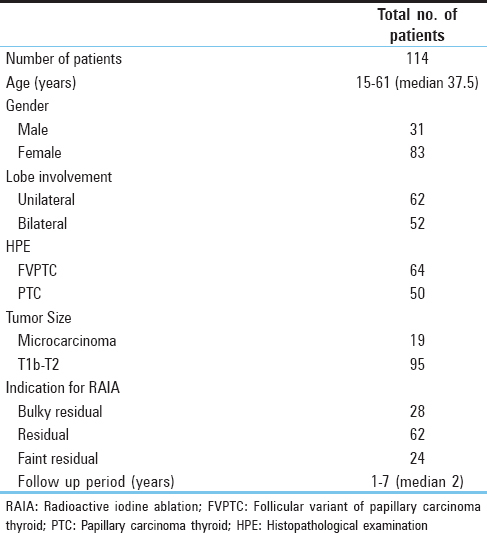 Follicular variant of papillary carcinoma constituted the most common malignancy 64/114 (56%) followed by classical papillary carcinoma 50/114 (44%). Preoperative ultrasound (USG) was performed in all patients, but information regarding the same was available for only 96/114 patients as the rest of the 18/114 had it done elsewhere [Figure 1]. Among these 96 patients, the USG reported unilateral involvement in 44 (45.8%) and bilateral involvement in 52 (54.2%). 30/44 patients with solitary nodules in USG underwent a TT, whereas the remaining 14 underwent a diagnostic HT followed by a completion thyroidectomy in view of DTC on histopathology. Unilateral disease was found in 27/44 (61.3%) on histopathology, whereas 17/44 (38.6%) had bilateral involvement. Among these 17 patients, 9 had a microcarcinoma, signifying that the rest 8/44 (18.18%) would have been missed complete treatment if the guideline of just HT in LRDTC was followed. TWBS was performed for all patients after surgery, and this was followed by RAIA. The indication for RAIA in all patients was residual thyroid. Among patients with macrocarcinomas with SLI as well as those with BLI, there was a significant fall of the sTg level following RAIA as compared to that before RAIA (P = 0.009 and 0.012, respectively) [Table 3], [Table 4] and [Figure 2], [Figure 3]. The median duration of follow-up was 2 years (1–7 years). 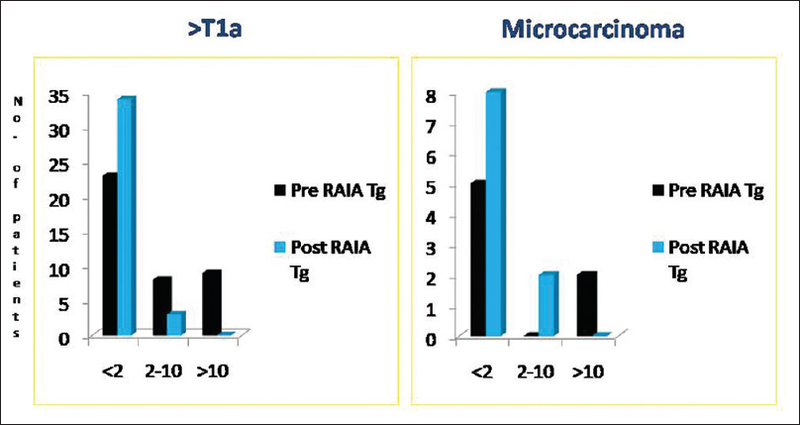 Local recurrence was seen in one patient 4-year post-RAI – she received one dose of 100 mCi RAI in 2013 and was lost to follow-up thereafter for 4 years. In 2017, USG showed local recurrence with biopsy confirming it as poorly DTC. However, no metastatic disease was seen in any of the patients on review. In LRDTC, the appropriate surgical procedure in terms of hemi/TT has been an area of debate and controversy. Few studies have stated that a hemithyroidectomy is sufficient in these patients. This plan of management has also been endorsed by the ATA 2015 guidelines. In the background of this, we felt the necessity to look at our own data to substantiate this statement. One of the objectives of this study was to examine whether HT is adequate in LRDTC patients. Patients were categorized into two broad groups: those with tumor in one lobe and those with BLI. A PTC <1 cm in maximum diameter is called a papillary microcarcinoma (PMC) of the thyroid. PMCs are typically found incidental to the original indication for thyroid surgery and are very low-risk lesions with negligible risk of disease-specific mortality and <1% risk of distant metastasis. In our study, of the 19/114 (17%) microcarcinomas, there were no distant metastases. However, according to the study done by Oda et al., active surveillance is now recommended as the best choice for patients with low-risk PMCs. We found that in our study, there was no statistically significant difference between the pre- and post-RAIA Tg values in microcarcinoma patients. This is correlated with findings in a study by Bilimoria et al. that there is no difference in outcomes between TT and lobectomy in this subgroup of patients. PTC being multifocal, the involvement of the contralateral lobe justifies radical surgery. Literature that supports the superiority of radical surgery mainly underlines three issues. First, it helps in reduction of local recurrence; second, the possibility of a reliable follow-up with stimulated thyroglobulin levels; and third, the use of I-131 both for treatment and TWBS as the main reason for the choice. These factors were considered resulting in having all the patients either undergo TT or completion thyroidectomy in our institution in this time period. Despite the increase in incidence and hence the increasing importance of DTC, it generally has a good prognosis. The prognosis is strongly related both to the stage of the disease and to the presence of risk factors. This re-emphasizes the importance not only of early diagnosis but also of seeking targeted selection criteria and more reliable prognostic factors. It also helps to allow the early and conservative treatment of these tumors, which is one of the most frequent endocrine neoplasms, even in the pediatric age group. In our study, it was found that 94% of the patients required only one dose of RAIA and were kept on regular follow-up, with sTg levels becoming almost negligible in 99/114 (87%) patients. In a study done by Bilimoria et al., 52,173 patients had undergone surgery for PTC. Patients who underwent TT were 82.9% while 17.1% underwent lobectomy. A 10-year recurrence rate was 4.6% in tumors <1 cm, 7.1% in 1.0–1.9 cm, 8.6% in 2.0–2.9 cm, 11.6% in 3.0–3.9 cm, 17.2% in 4.0–7.9 cm, and 24.8% in tumors >8.0 cm. For those patients whose tumor size was <1 cm, the extent of surgery had no impact on recurrence or survival, while for those patients with tumor size more than 1 cm, lobectomy resulted in higher risk of recurrence and death (P = 0.04). Since our study was a retrospective study wherein either postcompletion/TT patients were included, it was only possible to look at the involvement of tumor in either or both lobes. In a meta-analysis done by Macedo and Mital comparing TT versus TL, for PTC ≤1 cm, it was concluded that TT was associated with lower recurrence rates and lower mortality rates. Considering the profile of patients who come to our institution, a stringent follow-up in these individuals for the recurrence and mortality rates was practically not feasible. However, in a retrospective study by Kuba et al., wherein 173 patients with 1–5 cm PTC tumors treated by curative surgery from 1994 to 2008, they concluded that the 10-year recurrence-free survival (RFS) and overall survival (OS) of all patients were 93.3% and 96.7%, respectively. There was no significant difference in RFS (90.6% vs. 93.0% in TT and TL groups, respectively) or OS (96.2% vs. 96.9% in TT and TL groups, respectively) according to the extent of surgical resection after propensity score matching. Equivalent prognoses were observed for patients with 1–5 cm PTC tumors treated by TL or TT after propensity score matching. However, 10-year follow-up period is not adequate to show the advantage of TT over hemithyroidectomy. Of the 44 patients with SLI on USG, 17 of them were found to have tumor in the contralateral lobe which indicated that even though the USG findings may be normal, the presence of tumor was to be ruled out with histopathological evidence. Nine of 17 patients were found to have microcarcinoma which correlated with the study by Ritter et al. where the median size of nodules was found to be 7 mm. For a patient with LRDTC, it was found by Shrime et al. that TT likely represents the most cost-effective initial surgical management. A study reported from Israel to evaluate physician adherence to guidelines, overall and by specialty. Questionnaires on the approach to low-risk PTC were distributed among 51 surgeons and endocrinologists treating patients with PTC in tertiary medical centers. There was a significant between-group difference in treatment preference: endocrinologists chose TT with RAIA, while surgeons favored hemithyroidectomy alone. Therefore, this bias in the treatment preference may explain the differences in treatment recommendations. In another study, the prognosis of patients with solitary papillary carcinoma measuring 2 cm or less without massive extrathyroidal extension, clinically apparent lymph node metastasis or distant metastasis at the diagnosis was investigated to elucidate the appropriate extent of surgery for these patients. In conclusion, their findings suggested that solitary T1N0M0 patients have an excellent prognosis when they undergo thyroidectomy and elective lymph node dissection without radioiodine therapy. Regarding the extent of thyroidectomy, HT is adequate for these patients, if a 1% risk of recurrence to the remnant thyroid is accepted. However, in our study, it was found that there were 25 patients who had undergone completion thyroidectomy following HT, eight (32%) of whom had contralateral lobe involvement, signifying that HT alone was not enough even in LRDTC. 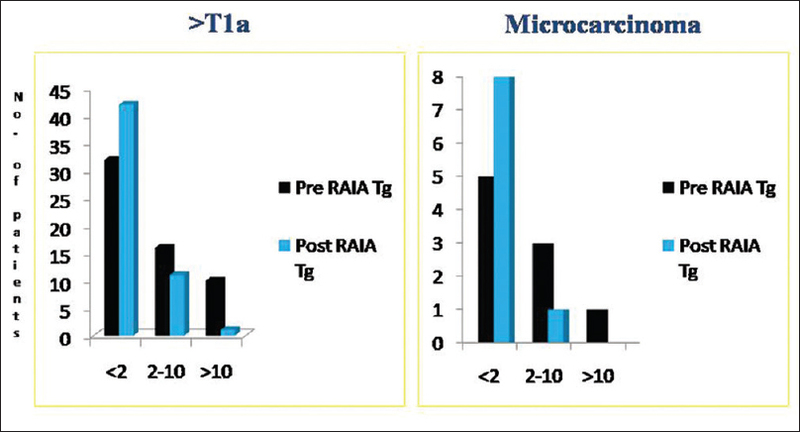 Since it was found that there were statistically significant decreased sTg values post-RAIA compared to pre-RAIA in >T1a category patients, radioiodine must be considered in patients having >T1a posttotal/completion thyroidectomy. Furthermore, it was noted that considering our local population, it was found that patient had good compliance with thyroid supplements, and regular follow-up with sTg (and TWBS initially) was warranted. In summary, patients with a small DTC who undergo HT alone are prone to a significant follow-up burden and risk of reoperation, with no clear benefit of the limited surgical procedure. This is particularly relevant in patients with bilateral thyroid nodules. In the era of personalized medicine, these observations must be taken into consideration by surgeons planning initial thyroid surgery, providing an additional argument in favor of TT in patients with LRDTC. This is a retrospective single institutional study with small numbers and a short follow-up. Patients with LRDTC carry a very good prognosis. In patients with solitary nodule of the thyroid, the role of TT in LRDTC patients as the first line of treatment cannot be underestimated, as 46% of patients were found to have tumor in the contralateral lobe as well. TWBS and sTg levels offer reliable information regarding current disease status. Significant fall in sTg levels following RAIA as depicted in our study justifies the RAIA of remnant lobe even in LRDTC (T > 1a). This will also facilitate early detection of recurrence when sTg alone is used for follow-up. We would like to thank Ms Hepsi Chelliah for helping us with the statistical analysis of the data. Sugino K, Kameyama K, Nagahama M, Kitagawa W, Shibuya H, Ohkuwa K, et al. Does completion thyroidectomy improve the outcome of patients with minimally invasive follicular carcinoma of the thyroid? Ann Surg Oncol 2014;21:2981-6. Adam MA, Pura J, Gu L, Dinan MA, Tyler DS, Reed SD, et al. Extent of surgery for papillary thyroid cancer is not associated with survival: An analysis of 61,775 patients. Ann Surg 2014;260:601-5. Gartland RM, Lubitz CC. Impact of extent of surgery on tumor recurrence and survival for papillary thyroid cancer patients. Ann Surg Oncol 2018;25:2520-5. Kluijfhout WP, Pasternak JD, Lim J, Kwon JS, Vriens MR, Clark OH, et al. Frequency of high-risk characteristics requiring total thyroidectomy for 1-4 cm well-differentiated thyroid cancer. Thyroid 2016;26:820-4. Katoh R, Sasaki J, Kurihara H, Suzuki K, Iida Y, Kawaoi A, et al. Multiple thyroid involvement (intraglandular metastasis) in papillary thyroid carcinoma. A clinicopathologic study of 105 consecutive patients. Cancer 1992;70:1585-90. Sobin LH. Histological typing of thyroid tumours. Histopathology 1990;16:513. Roti E, degli Uberti EC, Bondanelli M, Braverman LE. Thyroid papillary microcarcinoma: A descriptive and meta-analysis study. Eur J Endocrinol 2008;159:659-73. Oda H, Miyauchi A, Ito Y, Yoshioka K, Nakayama A, Sasai H, et al. Incidences of unfavorable events in the management of low-risk papillary microcarcinoma of the thyroid by active surveillance versus immediate surgery. Thyroid 2016;26:150-5. Bilimoria KY, Bentrem DJ, Ko CY, Stewart AK, Winchester DP, Talamonti MS, et al. Extent of surgery affects survival for papillary thyroid cancer. Ann Surg 2007;246:375-81. Schlumberger M, Sherman SI. Approach to the patient with advanced differentiated thyroid cancer. Eur J Endocrinol 2012;166:5-11. Macedo FI, Mittal VK. Total thyroidectomy versus lobectomy as initial operation for small unilateral papillary thyroid carcinoma: A meta-analysis. Surg Oncol 2015;24:117-22. Kuba S, Yamanouchi K, Hayashida N, Maeda S, Adachi T, Sakimura C, et al. 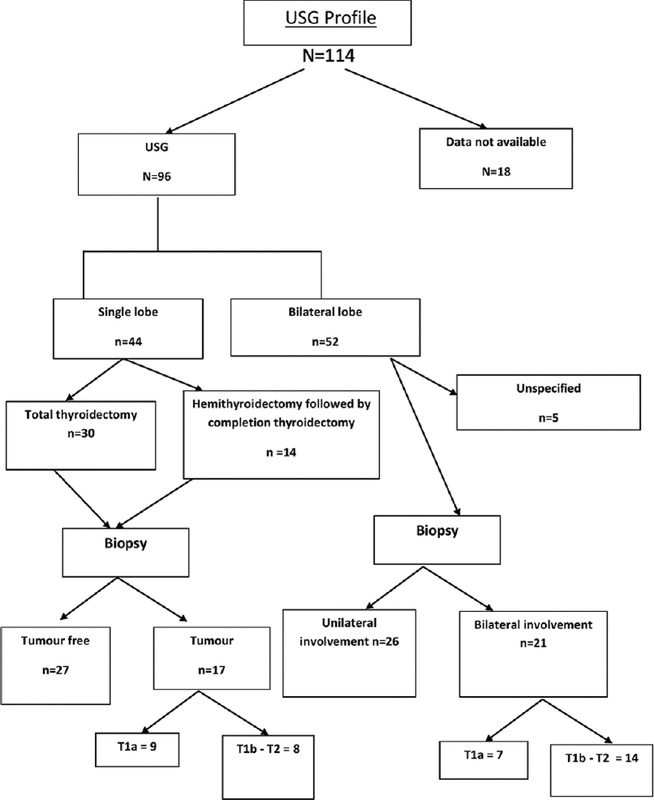 Total thyroidectomy versus thyroid lobectomy for papillary thyroid cancer: Comparative analysis after propensity score matching: A multicenter study. Int J Surg 2017;38:143-8. Ritter A, Bachar G, Hirsch D, Benbassat C, Katz O, Kochen N, et al. Natural history of contralateral nodules after lobectomy in patients with papillary thyroid carcinoma. J Clin Endocrinol Metab 2018;103:407-14. Shrime MG, Goldstein DP, Seaberg RM, Sawka AM, Rotstein L, Freeman JL, et al. Cost-effective management of low-risk papillary thyroid carcinoma. Arch Otolaryngol Head Neck Surg 2007;133:1245-53. Hilly O, Stern-Shavit S, Iran S, Feinmesser R. Treatment decisions and adherence to guidelines in the treatment of low risk papillary carcinoma of the thyroid. Isr Med Assoc J 2014;16:548-52. Ito Y, Masuoka H, Fukushima M, Inoue H, Kihara M, Tomoda C, et al. Excellent prognosis of patients with solitary T1N0M0 papillary thyroid carcinoma who underwent thyroidectomy and elective lymph node dissection without radioiodine therapy. World J Surg 2010;34:1285-90.